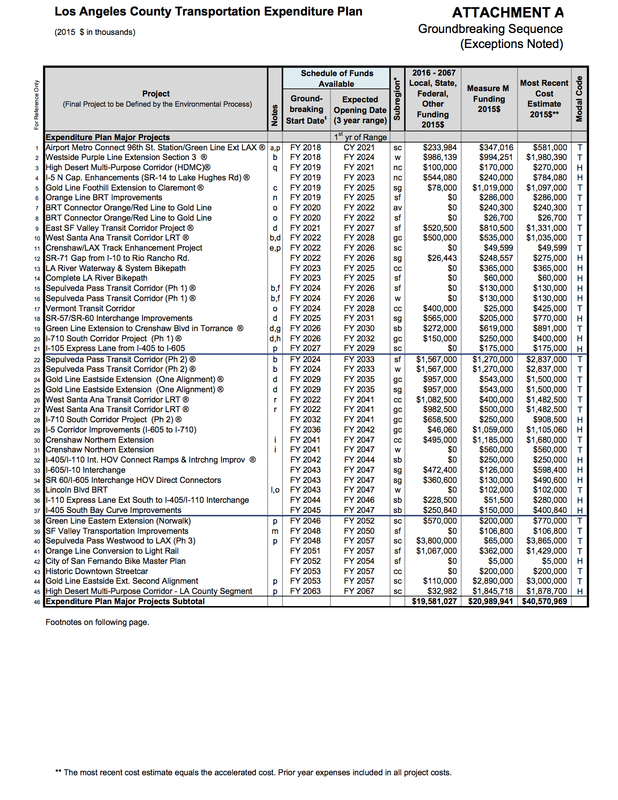 Here is the Measure M spending plan and timeline followed by brief project descriptions. New light rail connection from the city of Artesia to Union Station spanning 20 miles using city streets, Metro, and ports-owned rail right-of-way. The project would be built in two phases: first between Artesia and the Green Line and then between the Green Line and Union Station. Constructs a portion of the Crenshaw/LAX light rail line (currently under construction) adjacent to the LAX runways so it is fully underground. Extends Green Line Rail 4.7 miles, four stations, from Redondo Beach to the Torrance Transit Center.23. Vermont BRT Corridor: Hollywood Bl to 120th St Adds a 12.5-mile high capacity bus rapid transit corridor from Hollywood Bl to 120th St. The project could be converted to a rail service at a later date if ridership demand outgrows the bus rapid service capacity. Adds two Zero-Emission truck lanes in each direction, for a total of 18 miles, while maintaining current general purpose lanes. The project includes improvements to the Shoemaker Bridge. The project is planned to be built in two phases. New light rail connection from the City of Artesia to Union Station spanning 20 miles using city streets, Metro, and ports-owned rail right-of-way. Segment 2 would run be between the Green Line and Union Station. The new project provides direct connector ramps between ExpressLanes on the I-110 and I-405. Constructs a 12-mile bike path along the LA River connecting Canoga Park to Glendale. The project will complete the LA River Bike Path between Downtown Los Angeles and the San Fernando Valley. Constructs eight-mile bike path along the LA River connecting the Elysian Valley to the City of Maywood through downtown Los Angeles. The measure will complete the LA River Bike Path between Long Beach and the Sepulveda Basin in the San Fernando Valley. Builds a 3.8-mile streetcar along existing traffic lanes from 1st St to 11th St in downtown Los Angeles. FINALLY, on the day of the election, Metro is issuing a summary of the proposed Measure M projects. This is something that should have been done weeks, if not months, ago. Too bad that this list is not broken down by Sub Region nor are the projected start and completion dates shown. Instead, over the past several weeks I have prepared a summary sheet that I would have liked to see from Metro. These data were generated from several Metro webpages using several PC programs, such as PDF Converter and Microsoft Word and Excel. First I converted Attachment A of “Agenda Number:4.1 REGULAR BOARD MEETING. Of MARCH 24, 2016 PDF to a Word file and then to an Excel spreadsheet that I sorted by Sub Region and projected Ground Breaking Date. The process took approximately 20+ hours spread over several weeks. I assume that t would have taken Metro much less time because all of the date are on its website and easily accessed. I then converted http://theplan.metro.net/projects-subregions/#northco PDF file found by clicking on project map found on http://theplan.metro.net/ to a Word file and added projected Ground Breaking and Ribbon Cutting dates obtained from the aforementioned spreadsheet. New light rail connection from the City of Artesia to Union Station spanning 20 miles using city streets, Metro, and ports-owned rail right-of-way. I even made Word tables of the Local Return Allocations for all sub regions not included here for brevity reasons. The numbers for several projects are taken from the Metro data and correspond to locations on the overall LA County map. I could have added the estimated 2016 and escalated costs, but I felt this would not be of interest to the casual reader. These descriptions should also have enlarged maps of each sub region, but this was beyond my capabilities. Why can’t the 501 at least try to emulate what’s being proposed with the Orange BRT? The proposed BRT stops are exactly what’s needed on this route. Also, the BRT (& the 501) should terminate at Lake Station. It’s a quick and efficient transit stop. Let the Gold Line take passengers into the heart of Pasadena. Maybe it was a good thing after all that Measure J did not pass. The delay I think has given us a better system than before.